Unbeaten Birmingham boxer Kal Yafai has been handed a shot at the vacant Commonwealth super-flyweight title. Moseley-based Yafai, 24, will face former champion Yaqub Kareem, from Nigeria, on Wednesday, 21 May at the First Direct Arena in Leeds. And younger brother Gamal will make his professional debut on the same bill. "I'm very excited. I'm no longer a prospect and I believe I am ready for the big titles, starting with the Commonwealth," said Yafai. "Kareem has held the belt before and I know that it will be a tough fight, but I am confident of winning in style and building on that later in the year." After being sidelined with an injured bicep, the former Beijing Olympian returned to action in October, going on to claim his seventh win inside the distance from 10 professional contests two months later. Younger brother Gamal, 22, will begin his life as a pro in the super-bantamweight division. "I have wanted to go pro for a long time and I cannot wait to get out there in the pros and show what I have got," said Yafai, whose appearance is subject to the approval of his licence from the British Boxing Board of Control. 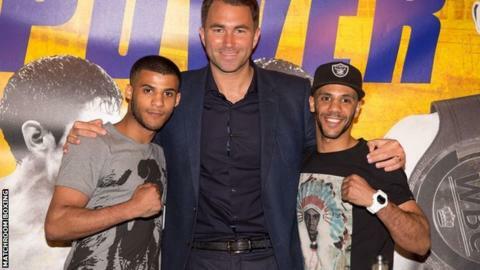 "I'm so excited to add Gamal to our roster of young British stars," said promoter Eddie Hearn. "He's a powerful and aggressive fighter, the kind of boxer that fans want to see. "Kal is ready to start stepping up into title fights now and if he can get his hands on the Commonwealth crown in Leeds, we will have the chance to put on some special nights in Birmingham with these two boys."